Admittedly this had to be forced down. I never struggle to eat breakfast so looking back at it now, I must have been nervous. Today was the day, the day id been training a good few months for. I was more excited than nervous, until I got there and saw lots of women weighing in at just under 75kg’s….and then I definitely felt more nervous than excited. 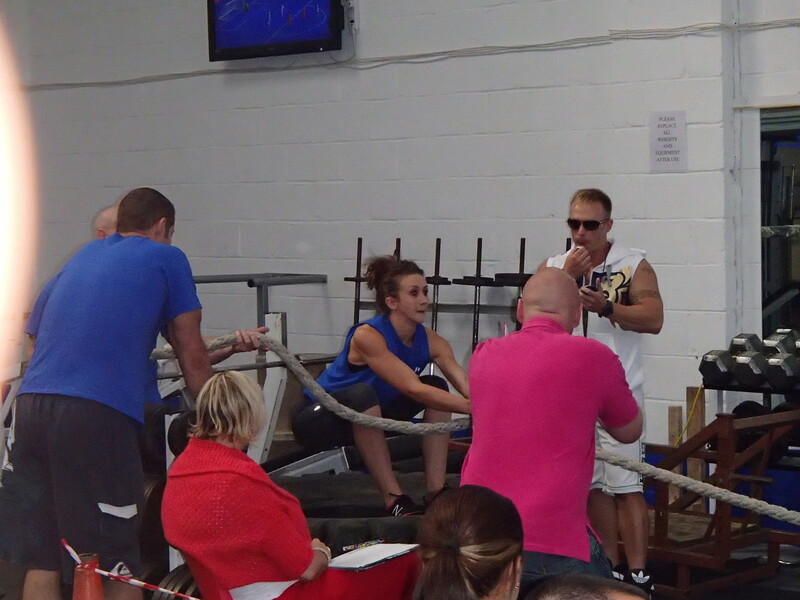 The competition was held at ‘Pro Strength and Fitness’ in Swindon and luckily I had trained here before which I definitely think helped. In order to decide the running order of the 1st event, every competitor picked a piece of paper at random with a number on, I drew 4th. I was glad I wasn’t 1st. I did feel for the competitor who had never done a competition before and drew 1st…but I wasn’t swapping! The idea of this event was to sit in a tractor tyre and pull the van in the quickest time possible. 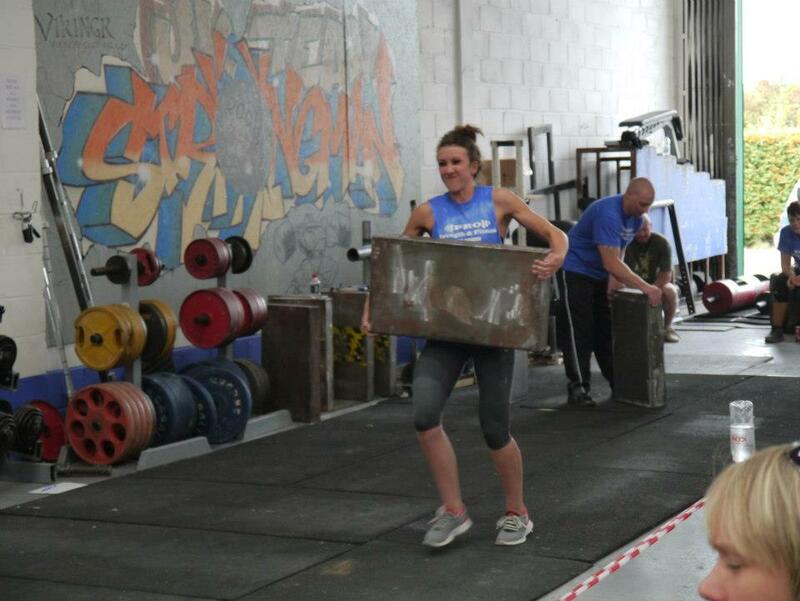 Id practised this several times, pulling a prowler and even pulling a truck in the gym car park so I was feeling fairly confident about this event. I just kept saying to myself “once you get it moving, keep the momentum going, and you will be fine”. When the whistle went to begin, I got the van moving much quicker than I thought I would and it flew down the track. It was all over in 17seconds, 7-10 seconds quicker than second place. 1st place. To win the first event really leaves you buzzing and ready for the next one. 2nd event:- Log Lift. Points: 40kg (1 point), 50kg (3 points) or 60kg (5points). Time Limit: 75 seconds. Having only ever done a 60kg log once, I wasn’t even going to attempt it. Before you do a competition, you should always make a plan and stick to it! My plan was to do the 50kg. Having placed 1st in the 1st event meant I was last in the running order for event 2, which meant I knew exactly how many reps I needed. I tried not to watch the other competitors compete, earphones in, keep warm, keep focused. So I relied on the others to tell me how many reps I needed to win the event, and I needed 5! I did 5 reps in about 45seconds and still had 30seconds left, so I did one more and left it there. 1st place. 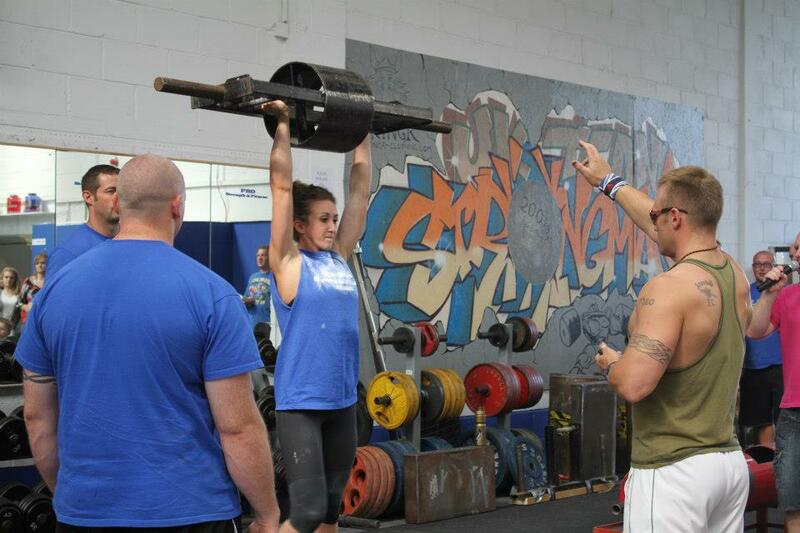 It was also pleasing to know that I was the only u75kg competitor to pick up the 50kg log. 4th event:- Farmers. Distance: 15metres. 60kg (each hand) and then straight into 80kg (each hand). Time Limit: 75seconds. Out of all the events, farmers walk is by far my least enjoyable, which is why I haven’t written much about it. Having England’s strongest man Arram Eghoyan help me with this event in training and on the day really paid off. Done in 24secs, thank god that was over. 1st place. This was originally supposed to be a block press medley but was changed to a loading medley on the day, which means nobody had really trained for this event. Before the event I practised picking up the blocks jus to get a feel for the best way to do it. They were more awkward than anything. Unlike the other events, I actually watched some of the competitors in this one. I was last in the running order again because of the previous event so I watched and tried to work out the best way to pick the blocks up and put them in the wheelbarrow. I was quick with moving the blocks from one end to the wheelbarrow and then running it back, but my pickups and drop offs were a little slow, leaving me in 2nd place for this event. The day before this competition I had said to myself “if you get 4th then you have done well”. I never expected to come 1st so as you can imagine I was somewhat shocked to win the title of Britain’s Strongest Woman 2012 u75kg’s. Massive thank you to everyone who helped me, especially James and Tom. Everyone on the day competed to a high standard and the competitors, supporters, refs and loaders all made this a great day.